Napoli keep their pace with Juventus in the Serie A league table after successfully securing a late winner against Palermo in the last match of the competition’s week 15 on Monday night at San Paolo. Despite dominating the match, the Partenopei needed a last minute goal from Christian Maggio deep in injury time to grab all three point and keep their joint third position with Juve in the table. 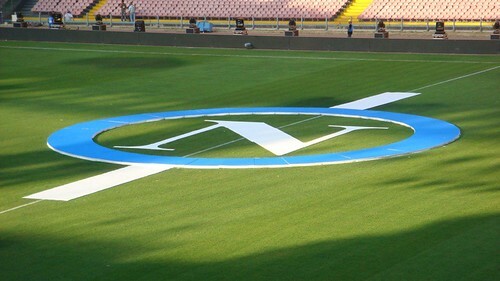 Being staged as the last match in week 15, Napoli and Palermo game can really be considered as one of the most exciting game this season as both teams are pact with plenty talented young players such as Lavezzi, Hamsik, Cavani, Pastore, and Illicic. Despite there’s not much to choose from the quality of both squads, it was the home team that had more of the chances as the Sicilian seem content playing through the counter using the pace of their attacking players. The first period saw both teams forced to settle for a stalemate as the careful approach taken by Palermo managed to contain Napoli that are looking more hungry for the win by creating few goal scoring chances. The second half didn’t show much different in the game pattern aside from the home team increasing their pressure and creating more chances that forced the Rossanero keeper, Salvatore Sirigu, in making plenty excellent saves. Just as Napoli gets frustrated and the draw looked to be inevitable, Maggio came as the home crowd hero after the Italian international slotted home Cavani’s excellent cross, leaving Sirigu’s fine performance wasted in the end. The victory brings the Partenopei back into winning ways after the defeat against Udinese, the success also pushes the confidence of the players in aiming at least a top four finish by the end of the season. The late victory also kinda established Napoli’s habit of scoring late goals especially as the statistic confirmed that this season half of them were scored in the last 15 minutes of the match and often becomes the match decider. Not only in the league, the Partenopei also showed same kind of attitude in most of their Europa League encounter where they usually left it late before equalizing against some of their opponents.